Members of the public and local business can forever have their name on show at the new Rotary Lodge which is moving onsite to Bundaberg Hospital. Bundaberg Health Services Foundation is launching a new fundraising campaign to raise money for the modifications required to this new building to make it suitable to support accommodation and meet building compliance with Class 1b of the Building Code of Australia. While Rotary Clubs are once again lending their support to ensure this work is carried out, it also needs community support from both the North Burnett and Bundaberg communities. Bundaberg Health Services Foundation Manager Maria Burnet said the gardens needed a makeover and a paved path would be incorporated into the new design. “These pavers will not only form part of the garden in memory of Morrison James Marshall, a Biggenden man who passed away as a result of a tragic farming accident whose family and friends have donated a sizeable amount of money to assist in these renovations … but the fundraiser will raise the extra funds needed to see this project completed in a timely manner,” Ms Burnet said. 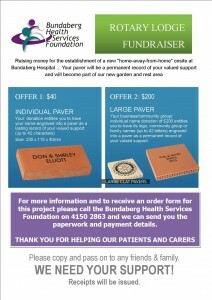 Individuals can buy a paver (230x115x40mm (up to 42 letters) for the cost of $40 with their name permanently engraved. Larger pavers are also available (300x300x40) at a cost of $200 for those groups or businesses that want to be involved. People interested in participating should contact the Foundation on 4150 2863 or send a cheque (made payable to the Bundaberg Health Services Foundation) to Attention: Maria Burnet, BHSF, PO Box 34, Bundaberg, QLD, 4670 and a receipt will be issued. This entry was posted on Thursday, June 26th, 2014 at 3:07 am	and is filed under Rotary Lodge News. You can follow any responses to this entry through the RSS 2.0 feed. Both comments and pings are currently closed.